The Texas Blind Salamander is a very rare type of salamander, and much different from one like the Northwest Italian Cave Salamander. Not to be mistaken as a lizard (like the Western Fence lizard), it is so rare, in fact, that they are found only in one place in the world. It is not quite as rare as the Yeti Crab though. A place very hard to get to. 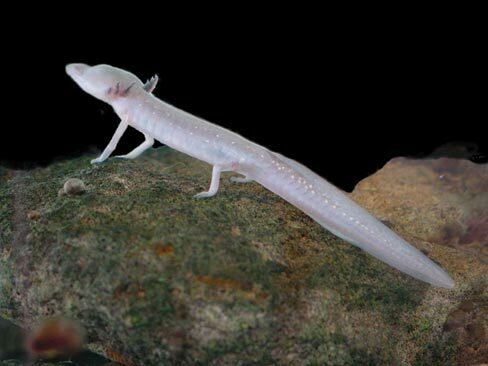 They live underground in the caves of the Edwards Aquifer in central Texas (similar to another Texas native, the Comal Blind Salamander) as the top predators there. These interesting creatures were first discovered in 1896 when a well casing was sunk into the ground by the U.S. Fish Commission for the National Fish hatchery at San Marcos, Texas. After the well casing had been driven down 190 feet water began welling up in the new well in addition to a few specimens of the alien looking salamanders(Springer 2007). As you might guess, in adapting to their cave environment, these salamanders have lost their eyes, as did the Blind Cave Fish. They have also adapted external gills which they use to breathe. In this website, we give a profile of these familiar creatures, uniquely adapted for life in a very alien environment. Check out the Classification page to see how this critter is classified within the various taxons or dive in to the Habitat page to see where it lives. For more info regarding the Texas Blind Salamander, visit these websites here and here.